I once heard someone say that they'd crossed the Mississippi three times in their life and that had been a huge accomplishment. I couldn't agree more. Anytime we explore the world, we're richer because of it. The reason that struck me as a bit funny, though, is because I cross the Mississippi many times a week, and I can go out on any given day and dip my toes in it. Each of us is blessed to live where we do and each place has a beauty all its own. 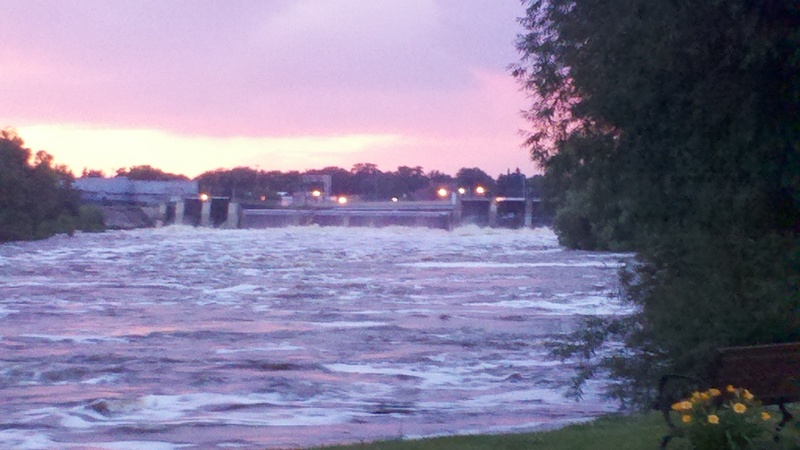 Where I live, that beauty is embodied by the Mississippi River. Here are pictures I've taken this year - some are from my backyard and others are from town. What about you? What embodies the natural beauty where you live?﻿ Have you ever crossed the Mississippi? I really enjoyed watching the Summer Olympics this year and one thing kept occurring to me: there is definitely a recipe for champions - and the ingredients that make up that recipe can be applied to anything we set our minds to, whether that be parenting, marriage, writing, or other pursuits. Passion - every champion starts with passion. For me, one of my passions is writing. I love the written word. I love to read it and I love to write it. It's so much more than entertainment for me; it's a way to communicate the essence of who I am. I love expressing who God created me to be with the words he places on my heart and my greatest prayer is that He uses those words for His Kingdom and His glory. Support - every champion has people who believe in her. For most, it starts with our parents, grandparents, teachers, aunts, uncles - anyone who influences us as children. As we grow, it becomes spouses, best friends and other. For me, other writers and readers have become part of my support system. 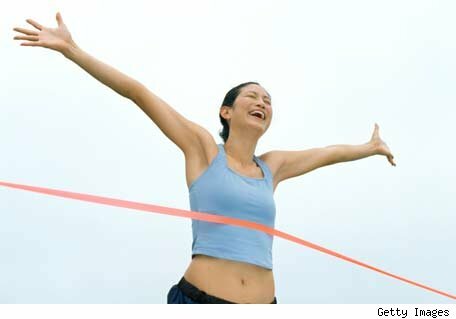 People who cheer you on when you've reached a milestone and those who help you back up when you've stumbled. Support keeps us going. Good Coaching - every champion has a dynamic coach, or coaches, who show them how to succeed. For me, it's been my online writing friends, books I've read on the craft of writing, reading other books by authors I admire, and my husband. My coaches show me where I need to improve and they challenge me to do better each time I try. Commitment - every champion is committed to their pursuit. Just as an athlete must commit to training, day in and day out, no matter how they feel, I've had to commit to learning my craft, keeping my blogging schedule, finishing my weekly word quota and not giving up, even when I don't "feel" like continuing. I once heard that a writer's greatest enemy is their desk chair. So many times we feel like doing something else, but when we commit to getting published, we must plunk our bottoms in the chair and keep pressing forward. Determination - if I could designate one of these ingredients, above the others, as the most important, I would say determination would be it. Every champion is determined to be the best. Determination keeps us going. It is the fuel we need to chase after our dreams. When rejection comes, when we don't win, when we stumble along the way, determination kicks in and we get back in the game to try again. Without determination, there is no chance at becoming a champion. What about you? What ingredients do you think make up the recipe for a champion? Are these ingredients part of your plan? I thought it would be fun to spice things up a bit this Monday and share a favorite recipe with you! This one comes from my good friend, Beka. She made it for us at a MOPS (Mother's of Preschoolers) Steering Retreat five years ago and then put it in our MOPS Cookbook. It's super easy to make, it freezes well and it's crowd pleaser. Place frozen chicken in crock pot in the AM, or fresh chicken, cooked up any way. Crock pot chicken is the easiest to shred. Mix together cooked chicken, sour cream, cream of chicken soup and green chilies. Grease a 9x13 inch pan. Place about 1/3 cup of mixture in middle of tortilla and sprinkle a little cheese on top of this. Roll up tortilla and place in pan. When all the tortillas are made, spread the remaining chicken mixture on top and cover with left over cheese. Bake at 375 degrees, uncovered, for about 30 minutes or until cheese is browned. This recipe also freezes well. Place pan from freezer into oven and bake for one hour, covered with foil. Remove foil and bake another 30 minutes. What about you? What's for dinner at your house? Do you have a good chicken enchilada recipe? 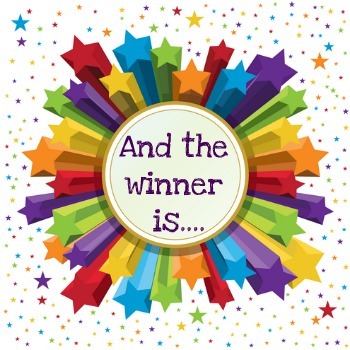 I have a winner for Donna Pyle's amazing giveaway! 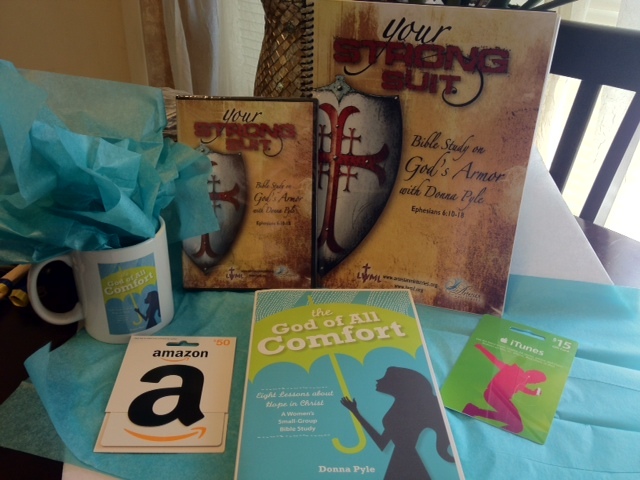 The winner receives a copy of Donna's newest Bible Study, The God of All Comfort, a copy of Your Strong Suit (including DVD teaching), a coffee mug, $15 iTunes gift card and a $50 Amazon gift card! I thought it would be fun to share some pictures of my childhood home today (no, it wasn't one of these gorgeous mansions!). My dad was the caretaker for the Musser & Weyerhaeuser Estate (above) and we lived in the carriage house below the hill. It sounds a bit like Sabrina, doesn't it? :) The estate wasn't quite as elaborate, but it was still a very magical place to grow up. I had a unique upbringing, to say the least, and it greatly impacted my love for history. ﻿Charles A. Weyerhaeuser and Richard “Drew” Musser came to Minnesota in 1891 and managed the Pine Tree Lumber Company, which was founded in 1890 by their fathers. The Weyerhaeuser Home (green house) and Musser home (white house) are neighboring mansions that occupy nine acres of wooded land on top of a small bluff called Linden Hill, overlooking the Mississippi river. These homes were designed by Clarence H. Johnston, the most significant architectural figure in Minnesota, and they were built in the shingle style in 1898. In 1920 the Pine Tree Lumber Company closed and the Weyerhaeusers moved their business to Washington State, where the company is still prominent today. Drew Musser stayed in Little Falls and went into banking. His daughter, Laura Jane, took over the green house in the 1950's after returning from New York City where she attended Juilliard. Laura Jane Musser was the last family member to live on the estate and when she passed away in 1989, the property was given to the city and is now operated as Linden Hill Historical Event Center. Laura Jane was a huge fan of the Wizard of Oz and her amazing collection of memorabilia is still in the green house. 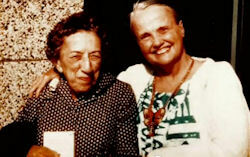 She and Margaret Hamilton (The Wicked Witch of the West) met in New York City and became life long friends. Margaret visited Laura Jane many times at her home. ﻿We moved into the carriage house when I was three years old. I have wonderful memories of Laura Jane and our time on the estate. It's still one of my favorite places on Earth. Two weeks ago it was just my hubby and the twins and I, so we took out the Jeep and visited my old stomping grounds. You can see why this place is still very magical to me and I love sharing it with my own family - and now you. make great memories on this estate. garden here and picking eggs in the chicken coop. what it would be like to live in the mansions. was to the left of this picture. marshmallows and popped Jiffy Popcorn. ﻿I hope you enjoyed a little trip down memory lane with me today! I have an amazing story brewing in my head for this estate...I can't wait to share it someday. What about you? Where did you spend your childhood? Do you ever go back and visit? 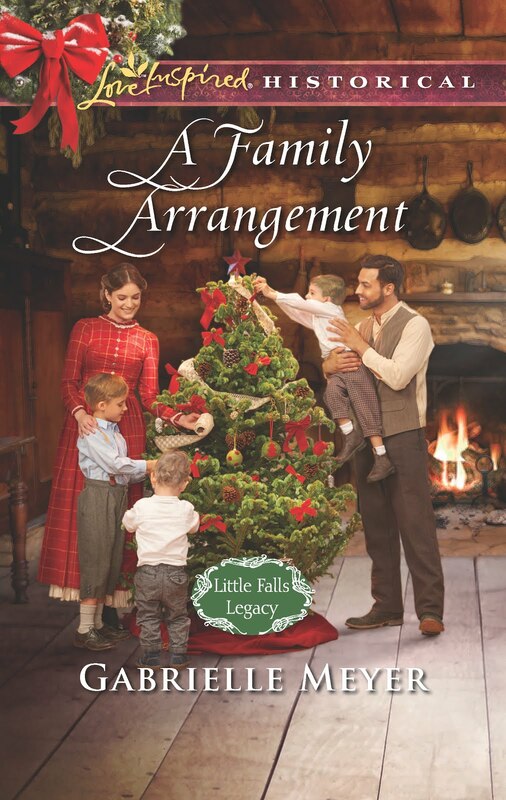 Don't forget, if you haven't entered the drawing for the wonderful gift basket from Author Donna Pyle, head over to My Guest, Donna Pyle (With An Amazing Giveaway!). The drawing ends on Sunday, August 26th at 11:59 p.m. You won't want to miss it! Donna is giving away two of her Bible Studies, including her new release, The God of All Comfort, a mug, $15 iTunes gift card and $50 Amazon gift card! In honor of this amazing lady and her stellar giveaway, I am keeping this post up for a couple more days! Please be sure to comment below to enter the drawing. 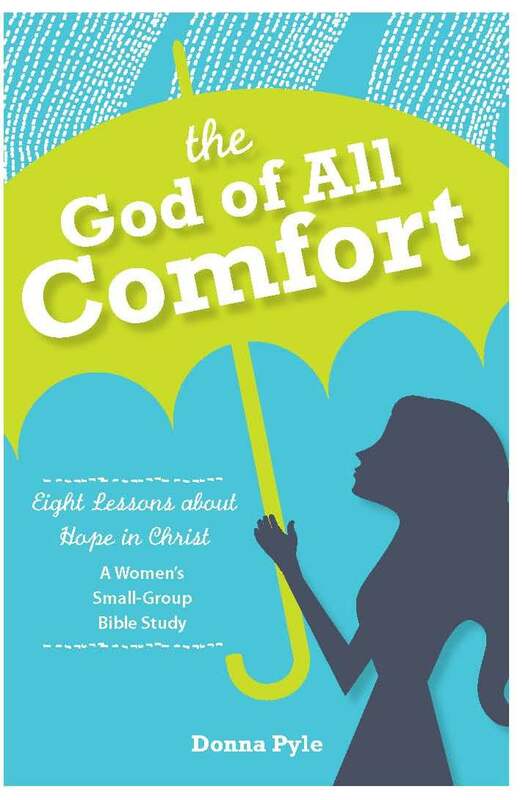 Today it is my great pleasure to host Donna Pyle, author of the new Bible Study The God of All Comfort. We would love for you to join in the conversation, so don't forget to leave a comment. Donna, I'm so thrilled to have you as a guest on my blog today and I'm even more thrilled that you're here to talk about your newest Bible Study, The God of All Comfort, which released last Wednesday. Welcome! Hi Gabrielle! Thanks so much for having me over to chat! It's my pleasure! This is your nineteenth study and I imagine each time you've written one, God has walked you through an incredible journey. What inspired you to write this one? Wow, you aren’t kidding. God is so faithful to transform us when we dig deep in His Word. All of us suffer hurt at one time or another. Our culture applauds seeking revenge and holding grudges. But that only complicates the hurt and brings no comfort. God comforts us from the inside out – if we let him. This study shows exactly how that works. I can’t wait to read it. Bible Studies are a great way to dig deeper into the Word, and I love knowing that this one will show us how to receive the comfort that only God provides. I've heard that each book an author writes becomes like a child to them, and they couldn't pick a favorite, but I know that there is usually one, above the others, that has special meaning. Have any of your Bible Studies become especially dear to you? What a great question! When I first became a Christian 21 years ago, I had trouble understanding God’s spiritual armor or why it was such a big deal. Then I wrote “Your Strong Suit,” a Bible study based on Ephesians 6. It changed everything! Understanding the protection He provides demonstrates His everlasting love for us. That sounds like an amazing study; I have so many of your studies to catch up on! I especially love knowing how it impacted your faith journey. Authors like to draw on their own life experiences to put into their writing, whether good or bad. If you could go back to one moment of your life to relive, which one would it be and why? I’d like to go back to April 29, 2003. I was sitting by my Dad’s hospital bed the last hours before he died from cancer. I kept trying to assure him that he was going to get better when we knew he wasn’t. I wish I would have told him again what a great Dad he was, how he helped shape me, and how much I loved him. I’ll just be sure to tell him one day in heaven. I remember you talking about your Dad on my blog, and your special memories of riding in a boat with him on the river. Your love for him is beautiful. If you could have a meal with three people, who are no longer living, who would you choose and why? Second, Walt Disney to hear him process a new, innovative idea from scratch. Third, the apostle John to thank him for loving Jesus so much and taking care of Mary the rest of her days. If you could have a meal with three people, who are living, who would it be and why? That’s easy, my three sisters. They are my best friends and we talk about anything and everything. And did I mention that we are HILARIOUS together? We each have a great sense of humor, so there’s always lots of laughter. Love it! I have a sister and two sister-in-laws and I can relate! Donna, thank you so much for joining me today. I count myself blessed to have connected with you via blogging. Your encouraging comments and faith filled blog posts have been a highlight on my writing journey. I pray that this Bible Study, and the others to come, will bring abundant blessings to the Body of Believers. I can't wait to meet you in person in Dallas! It's your turn to join in the conversation! If you could go back to one moment of your life to relive, which one would it be and why? Share this post on Facebook and Twitter throughout the week for extra chances to win! Each time you share it, tag me and I'll give you another entry into the drawing. @MeyerGabrielle (Twitter) and @Gabrielle Meyer (Facebook). The drawing will close on Sunday, August 26th at 11:59 p.m. I encourage you to get to know Donna better! 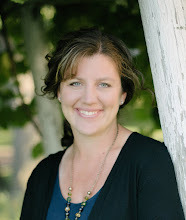 Donna Pyle is a soul-stirring, engaging speaker, author, Bible teacher, and worship leader, who has a passion for studying and teaching God's Word. Donna has authored 19 Bible studies, and published several shorter Bible studies and magazine articles. In November 2011, she released her first DVD-based Bible study series, "Your Strong Suit", based on the armor of God. 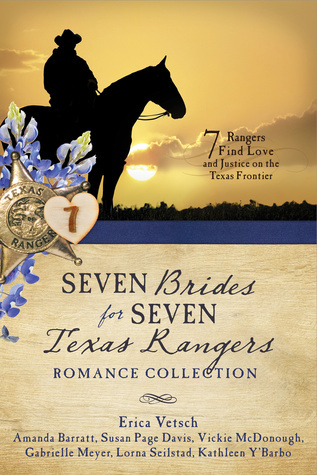 Donna is currently writing her next DVD Bible study series that will be taped live in January 2013 at Salem Lutheran Church, Tomball, Texas. Donna enjoys traveling, reading, singing, and driving her cats crazy with feather toys. I'm simply amazed at how quickly the summer is slipping through our fingers. Thankfully we've made the most of our summer vacation and we've made some great memories. Two weeks ago my mother-in-law stopped by unexpectedly and asked us to visit the zoo with her. We were excited to get out of the house and spend time at one of our favorite places. Our local zoo is the second oldest in Minnesota and it's undergone major renovation over the past ten years, making it a great destination for thousands of people to visit. Each Christmas, my parents buy us a family membership for the year, so we have the chance to go to the zoo countless times. It's a great gift! Here are some of my favorite pictures from this last visit. I hope you enjoy this little peek into Minnesota! years ago. Here she is with "her" Prairie Dog! saw the wolf he ran off and said: "HIDE!" played on some of this equipment when I was little! some in this picture of my youngest twin! The next best thing to writing a story, is reading one! 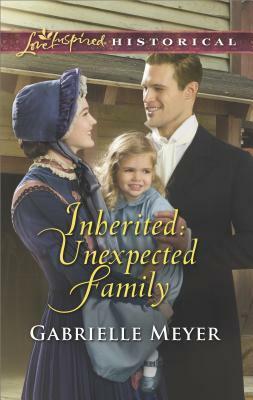 And when it's written in a beautiful voice, with stunning characters, breathtaking setting and a well crafted plot, I'm smitten! 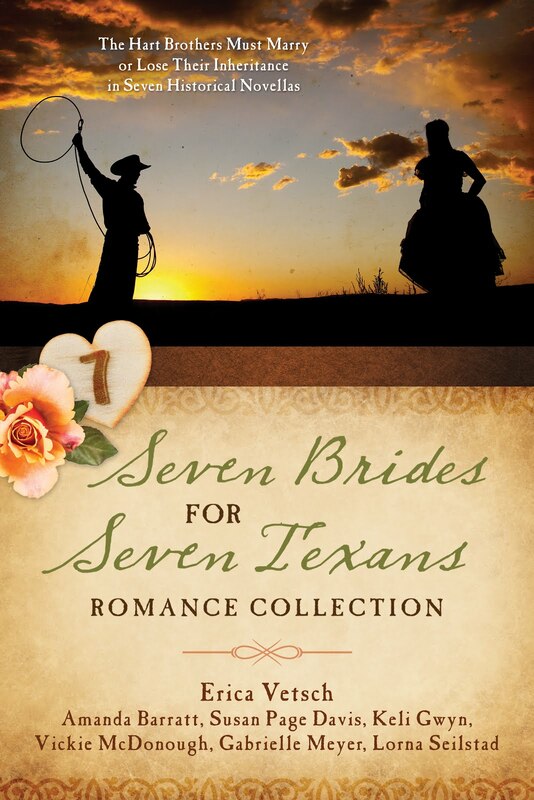 I'm currently reading Love on the Line, A Bride Opens Shop in El Dorado, California, Unending Devotion, and Love's Reckoning. I used to devour a book or two a week, but now that I'm writing, I only have the pleasure of a couple a month. 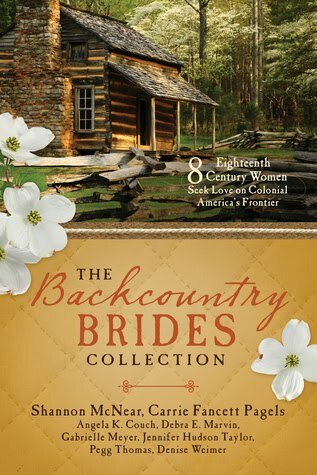 I'm loving each of these books, when I can sneak in a minute or two. Last night I was up well past my bedtime with Love's Reckoning. 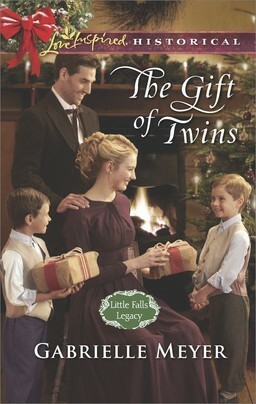 Laura Frantz' writing is captivating, to say the least! You know it's good when you look at the clock, thinking it's around 11 p.m. and it's almost 1 a.m.! What about you? What are you reading right now? Are you enjoying more than one book at the moment? What authors keep you up past your bedtime? Since I was a little girl, I've had the dream to write. I believe God put this dream in my heart because He created me to fulfill it. I was born to put words down on paper, to convey a message, tell a story, offer hope. That doesn't necessarily mean I was born to be a famous, well known author (but it could! ), what it means is that I was created to speak and write the words God has placed on my heart, for His purpose and His plan. Whether that's on my blog, in a published novel, or simply on the pages of my children's journals, I'm called to use words to express who God is and who He created me to be. The full expression of His creation. As I've stepped out and started writing more publicly, I've had this overwhelming sense of fulfillment. I feel that my words are an offering of worship to my Lord; the kind of worship that I was created to offer. I believe He's pleased with what I'm doing, and I'm basking in His pleasure. It's one of the most amazing experiences of my life, next to marrying my husband and giving birth to my children. There's nothing better in this life than to do the work God has called you to do. In church today we sang this song and tears came to my eyes. It expresses my heart exactly. To worship you, Oh my soul rejoice! May my voice, and the words I write, be a sweet, sweet sound in His ear. What about you? What dream is on your heart? What do you do that is an act of worship to the Lord? Do you feel His pleasure? I can't believe we're already heading into the middle of August. I feel like the summer just started, but we're already thinking about school again. My oldest will be in second grade and my six year old is starting Kindergarten. It will just be the boys and I home this year...strange. I remember when I had one child and the prospect of having a second one seemed daunting, I mean, how would I ever get out of the house? Now the idea of just having two at home seems like a breeze! We've been trying to sneak in a couple more fun activities before the girls head off to school. I thought I'd share two of our recent family outings - they both took place last Sunday. After church we took our boat out onto the river. It was the first time we've done this since moving into our new river house last spring - and boy is it different than a lake! We had to keep on the lookout for rocks and deadheads (floating logs). The Mississippi, in our neck of the woods, is very narrow, which gives it a cozy feel - and as long as you want to drive the boat, you can just keep on going - until you come to a dam, that is! We stopped at the "Sandbar" that we've been hearing so much about - and it was breathtaking. Here are the pictures I took. My youngest was thrilled when we saw the "Choo-choo"
After we came in from the river I took the girls to a drive-in theater in a nearby town. We joined my brother and his family, my parents and my uncle and his family. It was a blast! We saw the newest Ice Age - it was a great movie.